A tool that makes the process of quilting easier often gets a permanent spot in my sewing basket. I just tried out a new product that shows promise to take up residence there. It’s a fabric marker called Lapel Stick. The makers sent me some samples and asked me to review the stick as a tool for quilters. I was more than happy to give it a try. I wanted to see if the Lapel Stick would adequately hold down appliques on a throw size quilt top I was making – long enough to get it to the quilter to do a raw edge and quilt it at the same time. Beforehand, I took a pink block (Kaffe Fassett shot cotton I was using in the quilt) and glued it down to a base square of cotton fabric and left it alone overnight. The next day it was still holding. Best of all when I lifted the pink block off it did not leave behind any fabric fibers – good since you don’t want to stress your fibers. See photo above right. Next I tested a blue block using what I had on hand so the results are not going to be comparing apples to apples, but we are in the fruit family. I used a small amount of Elmers All Purpose Glue Stick to get the blue square (also shot cotton) onto the white base fabric and left it until the next day. When I lifted the blue block up it did leave some fibers behind. See photo above right. 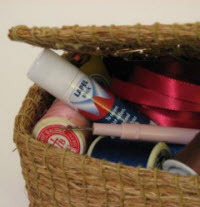 I did finally find a Fabric Glue Stick by Prym-Dritz in my sewing room. I brought it into the testing loop. As you would expect, it did not grab hold of the fibers as much as the Elmers but surprisingly it did grab some – much more than the Lapel Stick. Further, for designing purposes, I found the Lapel Stick glue more forgiving of changes as I moved pieces around (we quilters call it auditioning fabrics). 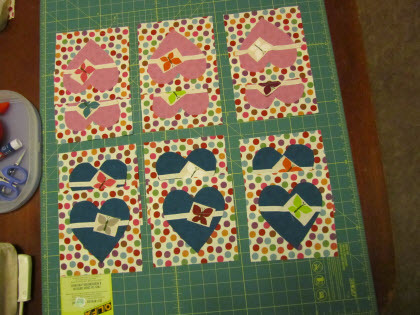 As I had planned, I used the Lapel Stick adhesive and the Prym-Drytz fabric glue stick for holding down the appliques I made from the pink and blue shot cotton fabrics on the quilt top. 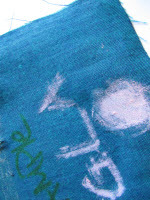 With a lighter hold, the Lapel Stick kept the appliques down better than the Prym-Drytz fabric glue stick. I’m a fan. Here is the quilt top in progress. When finished it’s going to a Mathematics teacher as a gift from her 4th grade students. 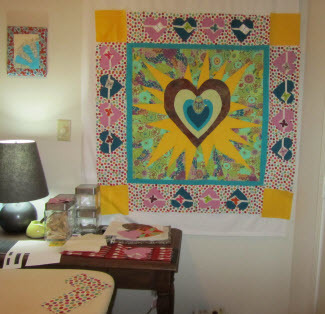 By the way, the center pattern is Love Emblem by Anna Maria Horner. I will do a later post to give away two Lapel Sticks for a lucky reader to try. I had read that I was one of the winners for the Lapel Stick. I believe it was the day after the winners were announced, I wrote in the comments asking what I should do and where to send my address but never heard back. As of today, I haven’t received the Lapel Stick, either. Now what?